Opening batsman Alastair Cook will lead England at the 2015 World Cup in Australia and New Zealand, says national selector James Whitaker. Several former players had called for Cook, 29, to be replaced following series defeats by Sri Lanka and India. However, he will lead a 16-man squad to tour Sri Lanka for a seven-match one-day series in November and December in preparation for the World Cup. All-rounder Ravi Bopara and batsman James Taylor will also tour Sri Lanka. Cook has been England one-day captain since 2011, taking over the Test side from Andrew Strauss the following year. Asked if Cook being captain in Sri Lanka meant he would skipper the side at the World Cup in February and March, Whitaker told BBC Sport: "Yes. "He's our exceptional leader, he has shown huge amounts of fortitude and resilience over the summer, and I'd like to make it perfectly clear we are 100% behind Alastair Cook as captain. "We feel he is our best man to lead the team into the World Cup. He's our number one batsman, he's showed that in the past and he'll show it again in the future." "This announcement commits Alastair Cook to a frantic schedule that includes the Ashes next summer. It's a risk, but he has stated that this is the chance of a lifetime. 'You are a long time retired,' he told me last week. There has been some tinkering following England's defeat by India. James Taylor will be a popular inclusion, Ravi Bopara a popular recall, with Gary Ballance unlucky to miss out. Sri Lanka will be tough opposition in conditions quite unlike those in Australia and New Zealand." There is no room in the Sri Lanka touring squad for Yorkshire batsman Gary Ballance, while seamer Stuart Broad is missing as he continues his recovery from a knee operation. "We know that Gary is an exceptional player," said Whitaker. "We just felt, for Sri Lanka, James Taylor and Ravi Bopara give us more flexibility in the middle order. "We have spoken to Gary and a plan will be put in place for him to be in the best position possible to challenge for a World Cup place in the new year." Both Bopara, 29, and Taylor, who has played in two one-day internationals, missed out on the chastening 3-1 series defeat against India at the end of the summer, but have earned recalls after successful seasons with their respective counties. Bopara scored three half centuries in five matches for Essex and will add vast experience to the England team with 108 ODI caps to his name, 2,453 runs and 37 wickets with his medium-pace bowling. Nottinghamshire's Taylor scored 444 runs in seven One-Day Cup matches at an average of 88.8, with three centuries and one fifty. The 24-year-old told BBC Radio 5 live: "I'm delighted to be back in the squad. We've got a seven-match series against Sri Lanka before the World Cup so it's up to me to make a statement in that series and hopefully cement my place." Asked about Cook as captain, Taylor said: "He's an exceptional talent, an experienced player and he's our leader. He's got the backing of all the staff and all the players. "He's scored hundreds of runs in the last few years in all formats and I'm sure he'll get back to scoring heavy runs." 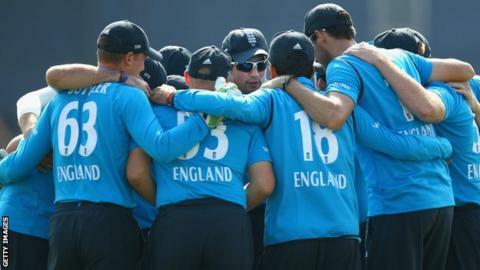 Moeen Ali and James Tredwell will share the spin bowling duties in Sri Lanka, while all-rounders Ben Stokes, Chris Woakes and Chris Jordan complement a seam bowling attack which also includes James Anderson, Steven Finn and Nottinghamshire left-armer Harry Gurney. Alex Hales keeps his place at the top of the order after making his debut against India and scoring 92 runs in four matches. Batsman Jonathan Trott is not in the squad despite helping Warwickshire to the final of the One-Day Cup with almost 500 runs. The 33-year-old has addressed the stress-related condition which forced him out of last winter's Ashes tour, and says he is ready to resume his international career. "We've been talking about Jonathan Trott for the last few weeks and we're very pleased he's come back and done well for Warwickshire," added Whitaker. "I'm sure throughout the winter we'll continue to have those discussions about Jonathan because he's been an exceptional player in the past." Spinners Adil Rashid and Stephen Parry will travel with the squad to help the side prepare, before joining up with the England performance programme (EPP). Yorkshire openers Adam Lyth and Alex Lees are also among the 19 players on the EPP, which will be led by former head coach Andy Flower. The programme will consist of training blocks at the National Cricket Performance Centre in Loughborough before a three-week camp in Sri Lanka for spin bowlers and batsmen, while the fast bowlers will train in Potchefstroom, South Africa. England ODI squad to tour Sri Lanka: Alastair Cook (Essex, captain), Moeen Ali (Worcestershire), James Anderson (Lancashire), Ian Bell (Warwickshire), Ravi Bopara (Essex), Jos Buttler (Lancashire), Steven Finn (Middlesex), Harry Gurney (Nottinghamshire), Alex Hales (Nottinghamshire), Chris Jordan (Sussex), Eoin Morgan (Middlesex), Joe Root (Yorkshire), Ben Stokes (Durham), James Taylor (Nottinghamshire), James Tredwell (Kent), Chris Woakes (Warwickshire). England performance programme squad (batting and spin camp in Sri Lanka): Zafar Ansari (Surrey), Jonny Bairstow (Yorkshire), Sam Billings (Kent), Adam Lees (Yorkshire), Adam Lyth (Yorkshire), Stephen Parry (Lancashire), Samit Patel (Nottinghamshire), Adil Rashid (Yorkshire, Adam Riley (Kent), Jason Roy (Surrey), James Vince (Hampshire), Tom Westley (Essex). England performance programme squad (fast bowler camp in South Africa): Jack Brooks (Yorkshire), Matthew Dunn (Surrey), Mark Footitt (Derbyshire), Craig Overton (Somerset), Liam Plunkett (Yorkshire), Boyd Rankin (Warwickshire), Mark Wood (Durham).